Manufactured By – Motown Record Company, L.P. Marketed By – Motown Record Company, L.P.
Record Company – Universal Studios, Inc. Published By – Tricky Track Music Inc. Published By – Cori Tiffani Publishing, Inc. Tracks 1 and 2 [published by] PolyGram Int'n Publishing, Inc. / Cancelled Lunch Music / Slam-U-Well Productions (ASCAP) / 12 & Under Music / Tricky Track Music, Inc. (BMI). Contains elements from "Sugar Free", [published by] Tricky Track Music, Inc. Performed by Juicy. Used courtesy of Sony Music. Remix produced for Trackmasters Entertainment. Track 2 Kobe Bryant appears courtesy of Columbia Records. Track 3 © 1997 MCA Music Publishing, a div. of Universal Studios, Inc. / Mary J. Blige Music (ASCAP) / Slam-U-Well Productions / Jelly's Jams LLC (ASCAP) / 12 & Under Music / Jumping Bean Songs, LLC (BMI) / Sony/ATV Songs LLC / Cori Tiffani Pub., Inc. (BMI) / Saja Music Co. / Songs Of Lastrada (BMI) / MCA, Inc. / Joshua's Dream (BMI) / Zomba Songs Inc. o/b/o itself and Pubhowyalike Publishing (BMI) / Styleetron Music (ASCAP). Contains an interpolation of "I Get Around", published by Saja Music Co. / Songs Of Lastrada (BMI) / MCA, Inc. / Joshua's Dream (BMI) / Zomba Songs Inc. o/b/o itself and Pubhowyalike Publishing (BMI) / Styleetron Music (ASCAP). 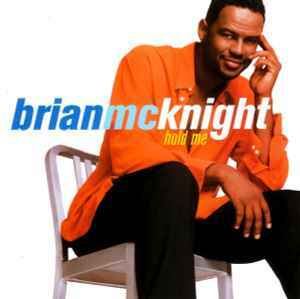 LP version appears on the Brian McKnight "Anytime" CD and cassette 314536215-2/4. ©℗ 1998 Motown Record Company, L.P., a PolyGram company. Manufactured and marketed by Motown Record Company, L.P.
Two other editions of this release exist. One with the same catalogue number but with a completely different set of matrix information (can be found here) and one with a slightly different catalogue number and an orange barcode (can be found here).